If you ask people what draws them to specific movies, you'll most likely get a variety of answers -- the actors, the story, the poster, the trailer -- it could be a myriad of things. I'd never heard of the In the Deep, but the second that I read the press release, I was interested. First of all, it's about sharks. Ever since witnessing all of the Jaws hype as a child, even though I was too young to see the movie, I've been obsessed with shark movies. Save for the Syfy crapfests in which sharks are combined with other animals, I try to see all of the shark movies that I can. Secondly, while actors are rarely the deciding factor for why I see a movie, I've always found Mandy Moore to be charming. So, you put Mandy Moore in a shark movie, and I am there. But, was In the Deep worth my time? Lisa (Mandy Moore) and her sister, Kate (Claire Holt), have traveled to Mexico for a vacation. While Kate thinks that it's simply a fun getaway, Lisa reveals that she and her boyfriend have split and that she's there to mend a broken heart. The pair play in the sun and then hit the clubs at night, where they meet Benjamin (Santiago Segura) and Louis (Yani Gellman). The two guys invite the girls to join them on a deep sea excursion to dive with the sharks. Lisa is hesitant at first, but she decides to go for it. The four meet at the dock, where they board the boat of Captain Taylor (Matthew Modine). The boat heads out to sea, drops anchor and Benjamin and Louis are soon going down in the shark cage. Once they are done, it is Lisa and Kate's turn. But, something immediately goes wrong and the women find themselves trapped with limited air. This is going to sound like an insult, but it isn't -- In the Deep is a good, old-fashioned B-movie. It wastes very little time in setting up its simple premise, and spends the remainder of its economical 87-minute running time working to wring multiple possibilities out of its ideas. Writers Johannes Roberts and Ernest Riera have followed the classic screenwriting formula of introducing the characters, ushering in the event which serves as the catalyst to the story, and then peppering the story with big and little twists which leads to a fairly satisfying conclusion. The pacing is good, although there are some moments in the third act when the simplicity of the story and setting begin to weigh on the movie. In the Deep shows real growth for director Johannes Roberts. I saw his 2012 feature Storage 24 and, save for the fact that I'd never seen a movie set in a storage facility, there wasn't much going for it. As with In the Deep, that film set up a basic premise, people trapped in a building with a monster, and then did little with it. With his latest movie, Roberts has clearly learned how to keep the audience engaged and, more importantly, how to take a somewhat unoriginal premise and give it life. We've seen shark movies. We've seen "trapped" movies before. So, this movie isn't offering anything new, but like a well-crafted deli sandwich, it's able to make this familiar material appealing. As with most satisfying films, In the Deep is the sum of its parts. Moore isn't necessarily known for dramatic roles, but she holds her own here. Holt is best known for the catty character which she plays on The Originals, but she pulls off playing an appealing person here. It seemed like Matthew Modine was everywhere in the 80s, so it's good to see him working again. The movie is technically sound, as the sharks look good, and Roberts knows to not show too much of them. As noted above, the story is fairly simple, but there is an added element of an implied subplot, which I won't divulge, that provides the movie with additional depth and is handled with some originality. In the Deep is not the kind of movie which is going to set the world on fire, but in a world where movies like Sharktopus and Sharkansas Women's Prison Massacre exist, it’s a beacon of light. 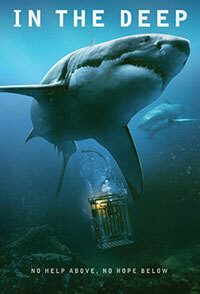 The movie may exaggerate the ferocity of sharks and it may borrow some elements from The Descent, but it’s entertaining. The mixture of sharks and claustrophobia works well and the movie rarely lets up. In the end, this is one of those movies which is better than a lot of junk which makes it to theaters, and it definitely deservers its shot. In the Deep offers yet another reason to not travel abroad on DVD courtesy of The Weinstein Company. The film has been letterboxed at 2.35:1 and the transfer is enhanced for 16 x 9 TVs. The image is sharp and clear, showing no overt grain and no defects from the source materials. The scenes on the boat show very good colors, and is not overly dark or bright. The underwater scenes are obviously very blue, and they do get a tad dark at times. The level of detail is good, and for a DVD, the depth is notable. The DVD carries a Dolby Digital 5.1 audio track which provides clear dialogue and sound effects. The underwater scenes deliver solid stereo and surround effects, and are often able to simulate the feeling of being surrounded by water. The subwoofer effects really kick in during the suspense scenes and when the sharks attack. The In the Deep DVD contains no extra features. This is a shame, because, for once, I wanted to know more about the making of a film. I would like to know where the film was shot and which sharks were CG and which were animatronic. Also, I couldn't help but wonder if the film was truly shot underwater, or if effects were used to make it look that way. When it comes to In the Deep, a funny thing happened on the way to the video store. (I realize that there aren't really video stores any more, but bear with me.) As you can see above, I received a copy of the film on DVD and proceeded to review it, as that's what I do. Little did I know that behind the scenes, someone had purchased the rights to the film and the DVD release was scrapped in favor of a June, 2017 theatrical release. 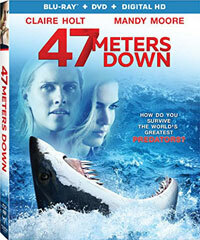 So, following that, on September 26, 2017, Liongate released the newly titled 47 Meters Down on Blu-ray Disc. The film has been letterboxed at 2.35:1 and the Disc contains an AVC 1080p HD transfer which runs at an average of 36 Mbps. The image is very sharp and clear, showing no overt grain and no defects from the source materials. The colors look fantastic, most notably blues and reds, and the image is never overly dark or bright. (Even at the bottom of the ocean.) The level of detail is excellent and the actors are nicely separate from the backgrounds. The Disc carries a DTS-HD Master Audio 5.1 track which runs at 48 kHz and an average of 4.0 Mbps. The track provides clear dialogue and sound effects. The surround sound and stereo effects work very well, especially once the action movie underwater. The sound of bubbles and the rickety cage add to the suspense. We get individual sounds from the rear speakers and the subwoofer effects truly enhance the jump scares. Unlike the DVD, we do get some extra features here. We begin with an AUDIO COMMENTARY from Director Johnnes Roberts and Producer James Harris. "Unexpected Originality: The Making of 47 Meters Down" (11 minutes) takes us on-set with Roberts to hear about the inspiration for the script, while Moore and Holt share their thoughts on the story. We learn that all of the sharks here are CG (thank you!) and that it was shot in the water. So, here's a belated kudos on how good the sharks look.